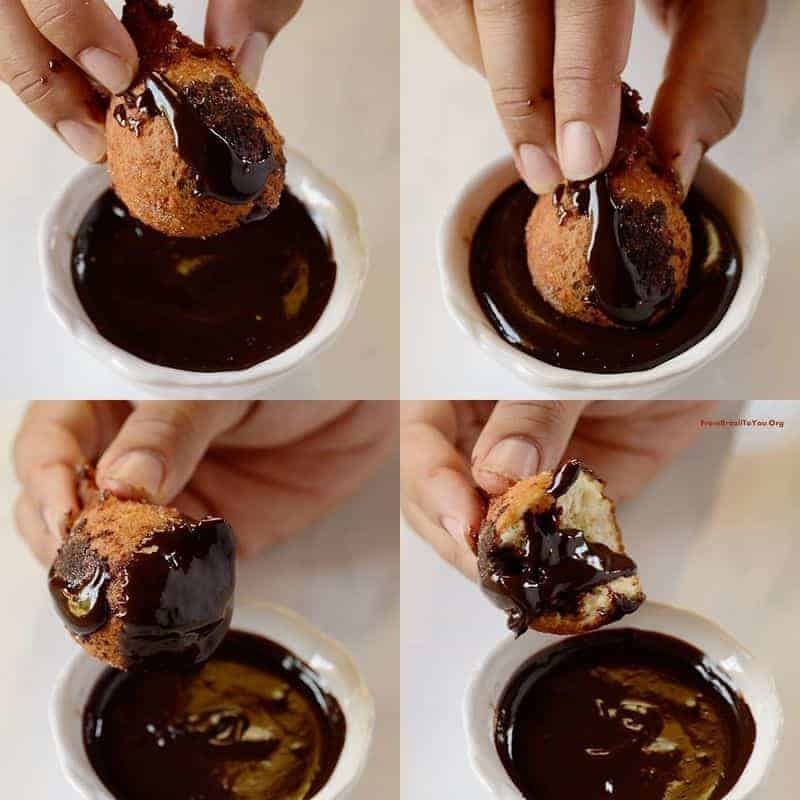 Brazilian Chocolate Truffle filled Doughnut Holes (Bolinho de Chuva com Chocolate) are some of the easiest and most versatile sweet bites that you can ever prepare… That’s right! You can have them for breakfast, an afternoon snack, or as holiday dessert. These doughnut holes have a dense cake-like texture inside, and are golden and crunchy outside. Although the filling is optional, who could possibly resist the chance to bite into a melted chocolate truffle, right? I am serious, folks! 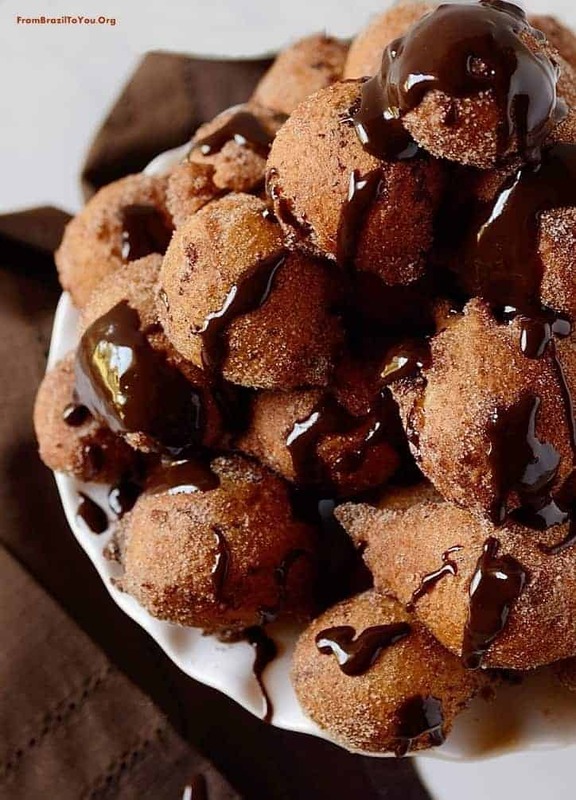 All you need to do is to quickly mix flour, baking powder, salt, milk, eggs, and vanilla extract, spoon the batter, fill with a little chocolate truffle in the center, fry in hot oil for up to two minutes, and roll in a cinnamon-sugar mixture. The result? Pure addiction! These were named Bolinho de chuva (literal translation: rain cakes) because of their raindrop shape, acquired when effortless dropping the spooned batter into the oil, forming little peaks. Despite the name, they can be enjoyed any time of year, regardless of the weather conditions. They are also known as Quero Quero, Mata a Fome, and Bolinho de Negra in my home country. They became famous thanks to the writer Monteiro Lobato and his fictional character, Aunt Anastasia, who lived in a countryside ranch called Sítio do Picapau Amarelo (Yellow Woodpecker Ranch). Aunt Anastasia, the cook of the ranch, captured the heart of many generations of Brazilians, and is now considered a staple of national culture. When and how to serve them is completely up to you! Whether you pile them up like a Christmas tree and drizzle them with chocolate ganache, like we did, in order to serve as a holiday sweet bite…or simply serve them in a basket or bag accompanied by a cup of coffee for breakfast or afternoon snack…or put them in a holiday box to give as a gift… the fact is, they will be a hit. 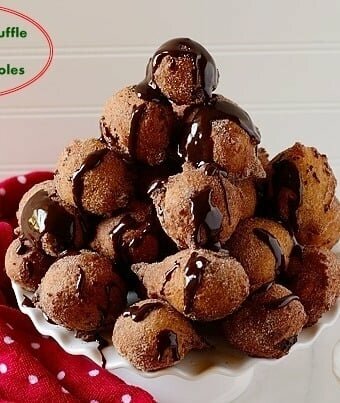 Brazilian Chocolate Truffle filled Doughnut Holes that are easy to prepare and a crowd-pleasing snack. Prepare the filling: In a medium microwavable bowl, mix the chocolate chips with the heavy cream. Microwave mixture at 30-second intervals, stirring between intervals, for about 1-2 minutes or until chocolate has melted. Stir well to obtain a homogeneous mixture. Let cool, cover with a plastic sheet and refrigerate overnight. Using a 1/2 teaspoon as measurement, spoon filling, form into balls, and place on a baking sheet lined with parchment paper. Freeze for about 20-30 minutes. Then, prepare the doughnut holes. To prepare the doughnut holes: In a deep fryer or deep, thick skillet, heat 4 inches or more of vegetable oil to 360 degrees (F). In a medium bowl, stir 3/4 cup of sugar with the cinnamon and set aside. In a large bowl, mix the flour, 1/3 cup sugar, salt, and baking powder together. With a wooden spoon stir in the eggs well and then of all the milk until obtaining a homogeneous mixture. If desired, stir in the vanilla. The batter will be thick and cake-like. Using 1 Tablespoon as measure (or a small cookie scoop), scoop the batter, and insert one frozen chocolate ball in the center. Carefully cover the top and all around the chocolate ball with the batter, using another spoon to help spread and smooth the batter around the ball. 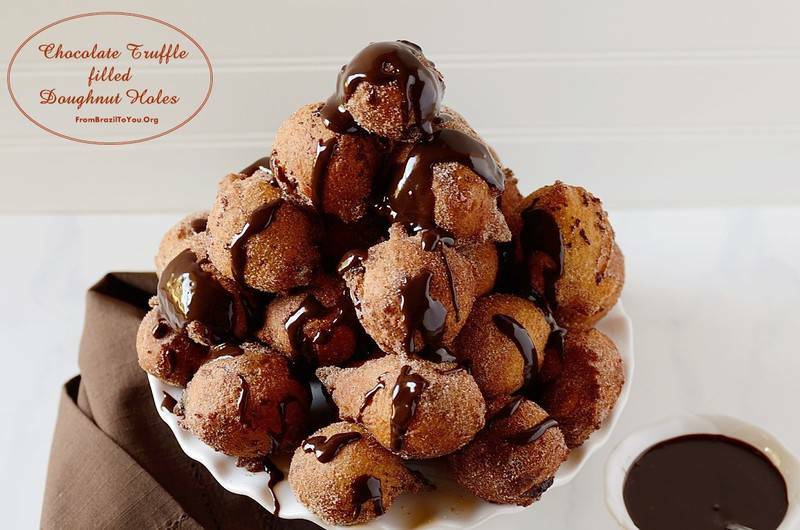 Make sure the chocolate ball is well covered with batter in order to prevent leakage of melted chocolate when frying. Drop the filled doughnut hole into the heated oil, using a second spoon to help scrape any residual dough off of the first one. When dropping it into the oil, make sure the spoon is down close to the surface of the oil in order to avoiding splashes and resultant burns. Repeat with several more doughnut holes, but do not overcrowd the fryer or skillet. Each will form into a ball with a pointy edge that will look like a raindrop. That is why in Brazil these doughnut holes are called bolinhos de chuva ("raindrop cakes"). Cook the doughnuts, turning occasionally after one minute or so, or until they are golden brown on all sides. Remove doughnuts from the oil with a slotted spoon, and place briefly on a baking sheet lined with double sheets of paper towel. Transfer to the cinammon-sugar bowl (or bag) and roll/shake doughnuts in the mixture while still hot. They will have a golden, crunchy exterior and a cake-like interior with melted chocolate. If desired, you can use chocolate kisses or Lindor chocolate truffles for the filling instead of the frozen chocolate ganache. It's up to you! Cook the rest of the doughnuts in batches. Doughnuts are best served warm by themselves, with a cup of coffee, or drizzled/dipped in chocolate ganache. They can be reheated or kept warm in the oven. Do not cover them or they will become mushy. SUGGESTION: If piling them up as a Christmas tree like we did, you can garnish with a few fresh mint leaves and/or raspberries as ornaments. INACTIVE TIME: 20-30 minutes. Traditionally, these Brazilian doughnut holes have no filling. They are usually served for afternoon snack or breakfast. But they make great sweet bites as well, especially when filled or drizzled with chocolate ganache, dulce de leche/caramel, or melted guava paste. This will be crowd pleaser for sure. Looks like a round churros! I love these amazing treats, fried, chocolate and sweet what more can I ask for. Its the perfect snack! What a scrumptious treat! These little wonders would disappear very quickly at my house! Happy holidays Denise! ooooh!! These look delicious!! 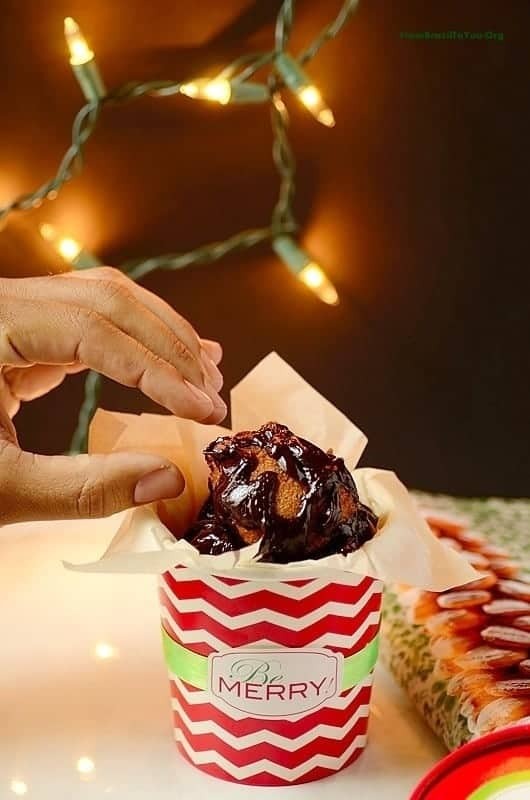 Perfect holiday treat. Have a wonderful Christmas, Denise. Much love from my family to yours. I could have a whole pile of them. They look amazing Denise. The crispy outer is just so perfect. Happy Holidays and MERRY CHRISTMAS my dear friend. Love and hugs to all. Wow, what a decadent and delicious looking holiday treat. I know your family must go crazy over these Denise! Have a blessed and Merry Christmas! OMG..they look crazy good! Ever since I saw them, I’ve been thinking of them. I think they came out of my dreams:-) Merry Christmas to you and family Denise! Thank you for this fluffy chocolate heaven. Amazing work. Chocolate? That’s all you had to say. 🙂 Happy Holidays, and see you next year! These are so much like our Loqaymat but we do not roll them in cinnamon after frying or fill them with anything 🙂 .. yours look so delicious and the idea of filling them with chocolate makes me drool….. Happy holidays to you Denise, best wished for you and your family. Dipping into chocholate I will eat all the doughnut holes. How fancy! How adorable! How sweeeeeeeeeet! Do you deliver ’em to Dallas area, dear? Would sell my soul to have some right now. LOL. Nusrat, my dear, thank you so much! I live in San Antonio and would love to meet you in person next time I go to Dallas. Wishing you a wonderful season and very blessed New Year. Thank you so much! We had a great Christmas… I hope yours was wonderful as well. May the New Year bring you many, many blessings.